Morrissey is brilliant, he is maddening, he is passion, he is everything! He still captivates our hearts, after all these years. He has been ranked as one of the top 10 living icons, so naturally you can’t help but me attracted to him. He is always up to no good and the rebel in us wants to proudly display him on our bodies. Don’t Panic! I found Morrissey shirts suitable for the whole family. 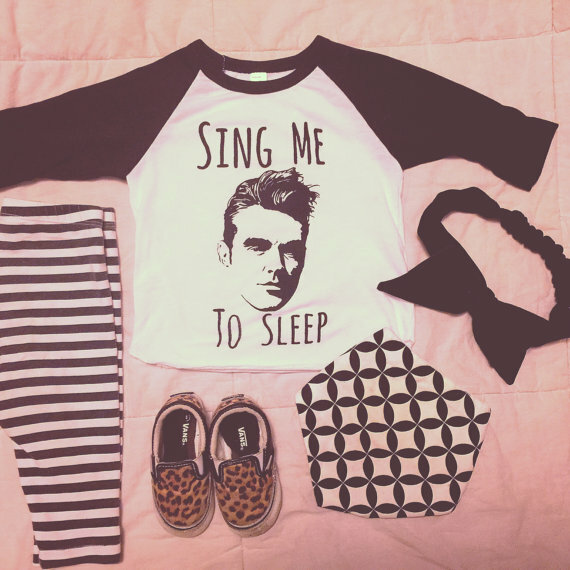 All Sewn Up Boutique really knocked it out of the park with their adorable Sing Me to Sleep Morrissey baseball raglan. Grab one for your little, so everyone knows they’re on team Morrissey. Your charming little man (or woman) would look perfect in this tiny Smiths shirt! The Morrissey this shirt, the more I’m glad it comes in my size too. Pick one up for your little and one for you as well. Twinning! We know you would sooner be blindly loved than judged. Now let the world know, the only person who can judge you is Morrissey, with Inked Shop’s Morrissey De Guadalupe raglan. Praise Morrissey! You’re a little bit metal, you’re a little bit Morrissey. Now there’s just the shirt for you! Heaven knows this shirt would make you the opposite of miserable. This Be kind to animals shirt is perfect for the animal lover in the family. Vegan friendly! Moz would approve. The perfect dapper shirt for you handsome devils! This pun never gets old. Let everyone know you’re as clever with your words as Morrissey with The Fresh Prince Smiths shirt. So rad! Your pups are family too and nobody will appreciate you remembering that more than Morrissey. In the spirit of Morrissey, let your pups in on the action! Anything you have seen on your interweb travels that we should add to the list?? We know you would go out tonight, and hopefully this list has helped you with some ideas since you didn’t have a stitch to wear.